Le Origini includes varieties of Moka coffee with a new and unmistakable taste and aroma that remind you of the warm sounds and colors of distant worlds. 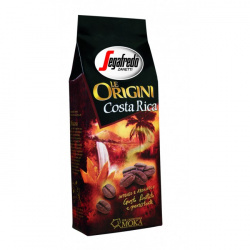 Three blends with great character and personality, the result of the passion and expertise of Segafredo Zanetti in the cultivation and selection of the best quality coffee, capturing freshly-ground coffee aroma in a new soft pack. Follow us on this journey to discover Le Origini Brazil, Costa Rica and Peru. With an annual production of over 50 million bags - about three billion kilos of coffee - Brazil is the largest coffee producer in the world. 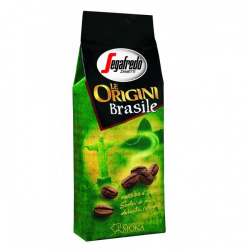 Thanks to a land rich in minerals, Brazil boasts a vast production of the Arabica coffee variety. In the heart of Minas Gerais, a variety of coffee with superior balance and mellowness, fragrant and delicate, with refined nuances of honey. The area of ​​Meseta Central in Costa Rica seems to have been created right to cultivate coffee: altitudes between 800 and 1400 meters, a fairly constant humidity of 81% and the average temperature of about 21° promote rich and healthy coffee crops. About half of Costa Rica's population lives in this region of volcanic highlands and plateaus, where they grow and harvest an excellent quality of Arabica coffee. From the lush vegetation of Costa Rica, directly selected from Beneficio in Sarchì of San Josè, comes a tropical coffee with distinguishing fresh features. The bouquet is intense and harmonios, the taste is fruity and persistent, round on the palate with elegant liqueur-like sensations. In Peru, there are 83 of the 103 microclimates existing on the planet. Thanks to this particularity and its altitudes, Peruvian coffee is one of the most appreciated in the world. In Peru it is possible to go along the “Ruta del café”, a road that untangles along the “Selva Alta” and touches all the symbolic places of the country's coffee production. The microclimate that characterizes the highlands of Peru is ideal for obtaining a rich and intense aroma, with precious nuances of chocolate enriched with caramel connotations. With a good body, velvety and ripe, it has a delicate aromatic aftertaste. 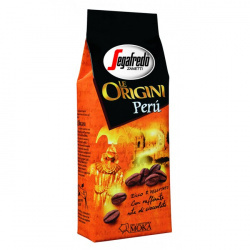 The soft pack of Le Origini Segafredo Zanetti has been specially designed to safeguard the original coffee fragrance: thanks to the special valve, the product is packaged immediately after toasting and grinding, keeping the aromatic-gustatory components unaltered.